Catherine Wilson began work as housekeeper for Captain Peter Mawer at his home in Boston, Lincolnshire in 1853 when she was 31. Mawer grew fond of Wilson and told her that when he died he intended to leave something in his will for her. Not long afterwards Captain Mawer died of an overdose of the colchicum (a type of crocus that was curative in small doses but poisonous in large) that he was taking for his gout. Since it was well known that the captain was a martyr to his gout, no one attached any suspicion to his housekeeper. Wilson applied for a job in London and lodged with 48-year-old Maria Soames at her home in Bloomsbury. Wilson arrived with a man named Dixon and it is possible that she married him. Soon the couple fell behind with their rent and Catherine decided that the best way to deal with this unfortunate circumstance was to murder her landlady. First, Dixon died under mysterious circumstances. An autopsy was carried out but the doctor missed the presence of colchicum. Four days later Mrs Soames, too, passed away. The autopsy again failed to reveal the presence of colchicum. Wilson then moved to Brixton and her wealthy friend Mrs Atkinson came to stay. On the fourth day of the visit Mr Atkinson received a telegram from Wilson informing him that his wife had died suddenly after being robbed of all her money. Next, Wilson began to work for a woman named Sarah Carnell and, tiring of using colchicum, she gave her sulphuric acid. Mrs Carnell spat it out and the liquid burned a hole in the sheets. Wilson fled but was arrested six weeks later for attempted murder and tried at the Old Bailey. She was acquitted when her lawyer persuaded the jury that a pharmacist had accidentally put the acid in the medicine bottle. As Catherine Wilson walked free from the courtroom she was immediately rearrested and charged with the murder of Mrs Soames. 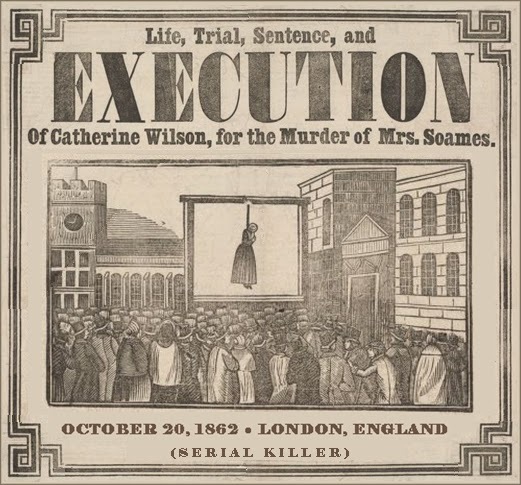 This time there was to be no escape and on 20 October 1862 Wilson was hanged at Newgate Prison before 20,000 people – the last woman to be publicly executed in London.